School bus tracking system provides real-time location of the bus which helps parents to know the time to drop students at the bus stop and time to receive them from the bus stop. Morning time is very stressful to drop and your daily routine has a tight schedule to receive children so you can't waste time at the bus stop. GPS school bus tracking system saves the time of parents and they get the assurance of safety and security of their kids. School administration can keep watch on a driver by monitoring the speed of the bus. Transportation safety is the first question by parents to school administration which has only one solution that is GPS based school bus tracker. This system gives peace of mind to parents as well as school administration. Accountability and responsibility are fixed through this technology system; parents and administration can monitor through technology services. Driving route, driving pattern, speed limits, vehicle breakdown and emergency situation are available through reports and notifications. It has been proved win-win situation for both parents and school administration. Parents can track bus through Mobile App. Parents can also install car tracking device in their car so that family members can track them. School Bus Pickup and Drop management. SMS Alerts to every parent about the latest location of School Bus. 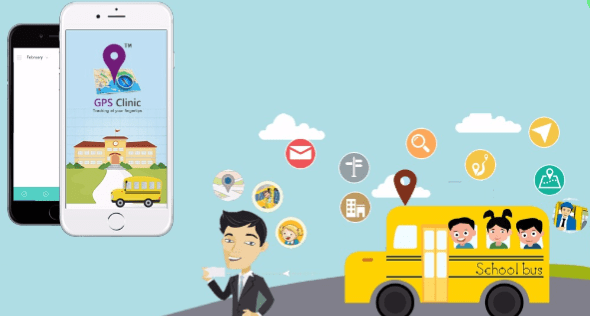 Mobile app for parents to track the School Bus. Real Time school bus tracking on mobile phones. Bus route optimization to reduce turnaround time, fuel consumption and expenses. Mogambo Screen®, that allows the transport manager to view live location of the entire fleet on a mobile screen or desktop. RFID/CCTV Integration to keep a bird’s eye view on students and driver while they are en route. Real time notifications in case of speed limit violations, vehicle breakdown or other emergency situation. Customized reports for the management related to bus timings, driving patterns or route taken by the driver to avoid illegitimate usage of transport system. Provides safety solution to parents. Monitor driver on various parameters. Rapid action on emergency requirements. Answerable to parents with facts and figures. School Bus Tracking is a real time location based Serivce. It enables you to track the location of the school bus and children while in transit. Allows parents to view the real time location of their kid’s school bus on their mobile. Peace of mind and reduced waiting time at bus stops everyday. Allows them to drop their kid to the next bus stop in case they miss the bus. Ensures safety and timely transit of students when they travel to school and back. GT03A magnetic GPS tracker with large built-in battery. GT06N The World's Most Popular GPS Tracking Device. WeTrack2 General GPS Vehicle Tracker. WeTrack Lite ( GV25 ) Mini Vehicle GPS tracker. Teltonika FM 1202- Waterproof GPS tracking device.